Schematic of the single-pass Nd:YAG ceramic planar waveguide laser amplifier system. Electro-optical efficiency is an important parameter for all-solid-state lasers. With higher efficiency, construction of laser devices can achieve miniaturization and reduce weight more easily. As a laser gain medium, a planar waveguide combines the advantages of slabs and fibers, such as high power and high energy conversion efficiency. Bonding is a popular technique for fabricating planar waveguide laser gain media. However, for planar waveguide laser media with large aspect ratios, the necessity of controlling the core thickness and mechanical strength of the bonding interface still restrict the development of this technology. Tape casting technology, which offers high precision and excellent controls of film thickness and composition, can overcome the difficulties of bonding. By utilizing the methods of tape casting and ceramic sintering, integrated preparation of planar waveguide laser ceramics can be realized. A YAG/Nd:YAG/YAG ceramic planar waveguide laser amplifier, fabricated by nonaqueous tape casting and solid-state reactive sintering, was jointly presented by the research group led by Prof. Qingsong Gao at Institute of Applied Electronics, China Academy of Engineering Physics, and the research group led by Prof. Jiang Li at Shanghai Institute of Ceramics, Chinese Academy of Sciences. A single-pulse energy of 327 mJ at a repetition rate of 100 Hz was obtained. To the best of the researchers' knowledge, this is the highest reported output energy with such good beam quality achieved with ceramic YAG/Nd:YAG/YAG planar waveguides fabricated by non-aqueous tape casting and solid-state reactive sintering. The report appeared in the Chinese Optics Letters, Volume 14, No. 5, 2016 (J. Liu et al., Diode-pumped composite ceramic Nd:YAG planar waveguide amplifier with 327-mJ output at 100-Hz repetition rate). 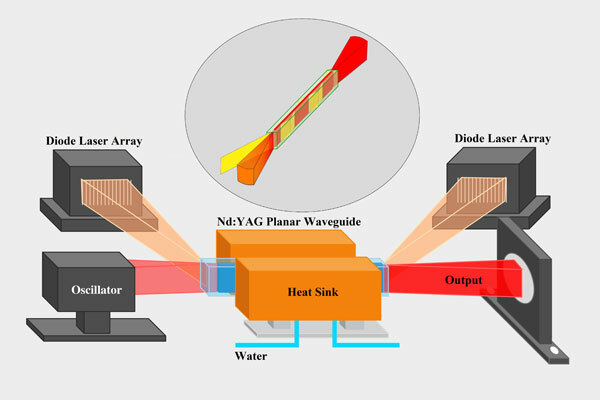 The experimental configuration of the Nd:YAG planar waveguide laser consists of three parts: the seeder, beam coupling system, and amplifier. The seeder used in this study was a Nd:YAG laser resonator. The dimensions of the laser medium were 1 mm ×10 mm × 60 mm. The ceramic YAG/Nd:YAG/YAG waveguide structure was formed in the thickness direction, and each end had an undoped YAG end cap. The pump beam from the diode laser array was launched into the planar waveguide from the end facet at a particular angle. A seeder laser was coupled from one end and amplified for a single pass. Commenting on this development, Prof. Qingsong Gao noted, "Besides the merits of high energy and high efficiency, its extremely small size enables miniaturization and lightweight design of laser systems. So, the ceramic planar waveguide laser is one of the future directions of development of high-energy all-solid-state lasers." Future research will focus on the development of ceramic planar waveguide lasers, such as further increasing their output power and efficiency and broadening their spectral range.